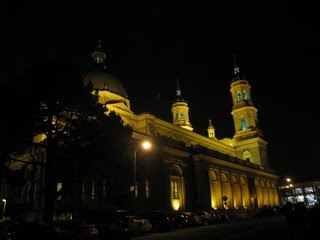 Last night we had our first performance of two ( the next one's on Saturday) in St. Ignatius in San Francisco. We call it ' the mother ship' because this is the acoustic which our Music Director has in mind when programming the concert. Also because there are so many fans, friends, donors, board members, and family who come to these performances in our home city. Like everyone everywhere so far, they loved the Distler "Es ist ein ros" and the Cui "Magnificat," as well as our Aztec and Spanish numbers with Dylan on the tambourine. Of course it wouldn't be Christmas without the Biebl Ave Maria and we wouldn't escape with our lives if it weren't on the program.